Deadly Multiplayer Party Game of Hide-and-Seek Features 17 weapons 18 Maps and 9 Game Modes. BAFTA winning frantic top down stealth-based arena shooter, At Sundown: Shots In The Dark is launching on PlayStation 4, Nintendo Switch and Xbox One on January 22nd. Previously launched on PC as a 90 day exclusive as part of the ‘First on Discord’ range of Indie titles, the game is also being made available on Steam for PC. At Sundown: Shots in the Dark boasts a plethora of options to keep players on their toes, including access to 17 weapons & power-ups, 18 maps, 9 game modes, plus team variations of those modes. 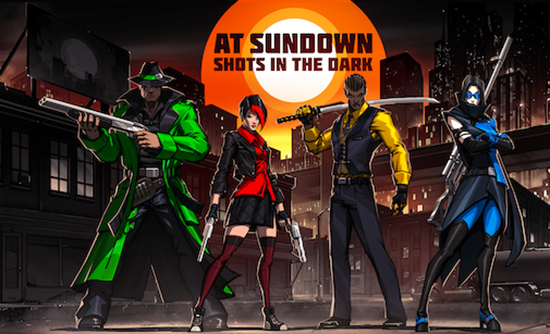 At Sundown: Shots in the Dark is a top down stealth-based arena shooter in which up to 4 players compete in online and local death match games. Players are under the cover of complete darkness and can only see themselves and be seen by their opponents when they shoot, dash or walk into or trigger a light source. “At Sundown: Shots in the Dark is a perfect fit for console and delivers the ultimate 4 player party set up. Mild Beast Games have created a hugely competitive and immensely fun title that will keep players coming back for more. The games forthcoming cross platform console launch underlines our commitment to bringing out the best in our indie partners.” commented Versus Evil General Manager Steve Escalante.